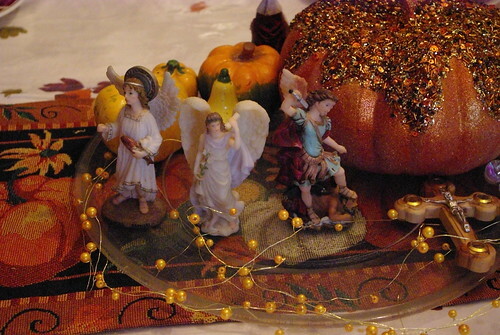 The Feast of the Archangels is one of those feast days that my family makes a special point of remembering during the liturgical year. We celebrate it in my family because one of my sons is named Gabriel, and our baby in heaven is named Raphael. 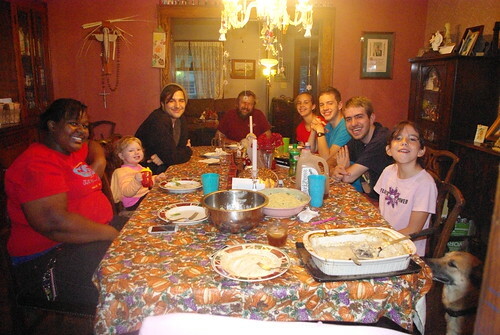 Over the years the faces around the table have changed, but we have always made more of a big deal over celebrating this feast day. 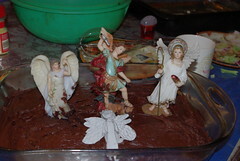 Our celebration includes mass and some special food -deviled eggs and devils food cake (for Michael's triumph over Satan in the battle of the angles) and angel hair pasta! which will be good for our runners who have meets this weekend as well! This is why I change the tablecloth and decorations in my dining room table to set a more fall-theme for the household. In the book of Revelation, From Revelation, we learn of the battle in heaven, with St. Michael and his angels combatting Lucifer and the other fallen angels (or devils). We invoke St. Michael to help us in our fight against Satan; to rescue souls from Satan, especially at the hour of death; to be the champion of the Jews in the Old Testament and now Christians; and to bring souls to judgment. Finally, recall the sublime words spoken on the day of the Annunciation-- "Nothing is impossible with God," and repeat them in hours of trial--to all I love--that their confidence in Our Lord may be reanimated, when all human help fails. Amen. Our knowledge of the Archangel Raphael comes to us from the book of Tobit. His mission as a wonderful healer and fellow traveler with the youthful Tobias has caused him to be invoked for journeys and at critical moments in life. Tradition also holds that Raphael is the angel that stirred the waters at the healing sheep pool in Bethesda. His name means "God has healed". 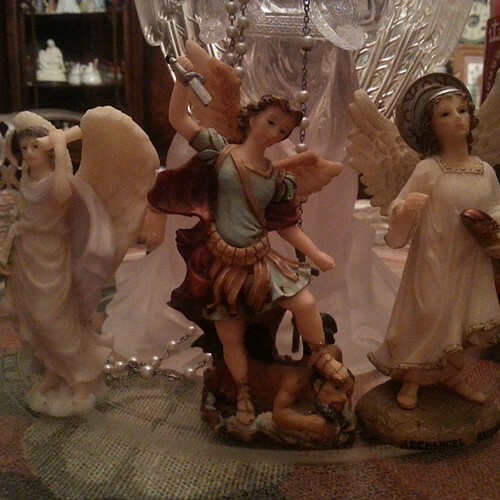 It has taken me some time to get statues of all three archangels. When I had the money, I bought them. 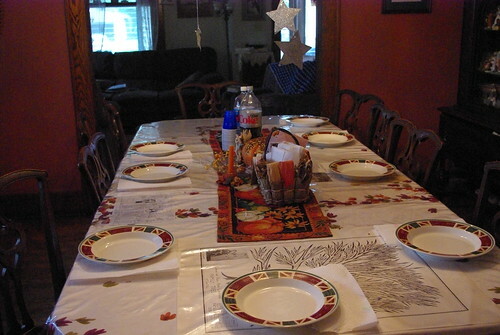 Here is what our table looked like three years ago for dinner on the feast day. 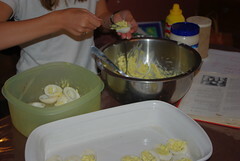 We have a traditional Angel Hair pasta chicken dish, deviled eggs, angel food cake, and some other goodies. The author of this book came to our church a few years ago and I had a chance to purchase this book and get his autograph! We will be using some of the meditations from it today as well.